This morning I spent my time in the Titan Subsurface and Interior sessions, and I’m glad I did because there were some cool talks. There were a couple that showed possible evidence for cryovolcanism (that is, “volcanoes” where the “lava” is actually water freezing to become ice). One talk by Rosaly Lopes showed radar images of locations called Hotei Arcus and Western Xanadu, and suggested that the lobate features that they observed were cryovolcanic flows. For me the images were tough to interpret clearly, and someone pointed out that traditional volcanic flows have sharp boundaries while many of these have more blurry edges. Higher resolution is probably needed to know for sure. A second talk by Robert Davies solidified the cryovolcanism case though. They showed that the details of the surface brightness changed, and that the changes were correlated with the detection of ammonia. Ammonia is commonly invoked as a sort of “antifreeze” agent to allow liquid water at the frigid temperatures in the outer solar system, so it is very suggestive to see ammonia accompany a possible cryovolcanic event. If this is indeed proof of cryovolcanism, it challenges the view of the moon as a pre-biotic Earth analog frozen in its early days. 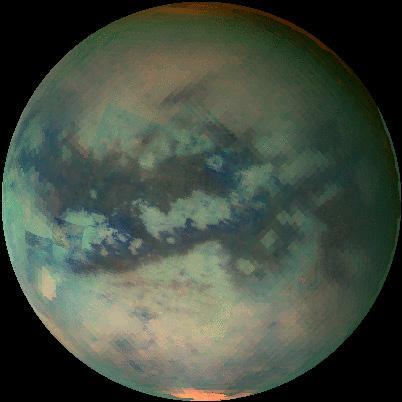 I think it is becoming clear that Titan is an active and fascinating place. Another Titan talk that I thought was cool was by Catherine Neish, and looked at the chemistry of tholins in water. Tholins are complex organic compounds that form in Titan’s atmosphere and are responsible for the orange smog that obscures the surface from view. It is easy to form tholins in the atmosphere, but harder to form pre-biotic compounds like amino acids. However, Neish showed that if you put tholins in liquid water, they quickly form oxygenated organic molecules more conducive to life. She also showed that pre-biotic compounds formed faster in solutions with ammonia in them. Since impacts or cryovolcanism could create pockets of liquid water for 100 to 10,000 years, and it only takes a few days in the lab to create pre-biotic compounds, it seems pretty likely that biological molecules could form on Titan! After lunch there was a series of special talks about exoplanets. Many of them were concerned with the amazing new knowledge that observing transiting planets can give us. 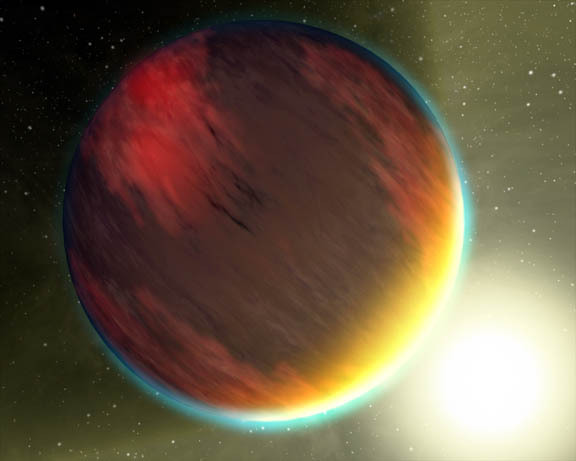 A transiting extrasolar planet is one that passes in front of its star, and it can give loads of information. When planets are detected using the doppler wobble of their parent star, it is difficult to tell how much mass they have, because a small planet orbiting edge-on to our line of sight can cause the same abount of wobble as a huge planet whose orbit is almost in the plane of the sky. When you have a transiting planet, that confusion goes away because you know that it is edge on with our line of sight – otherwise it wouldn’t pass in front of its star! This can tell you the mass and radius of the planet, which lets you calculate the density. Since we think we know the typical sorts of things that planets are made of, the density can give a good guess at composition! Also, with a transit, when the planet passes in front of the star, some of the starlight passes through the planet’s atmosphere, so careful study can reveal the atmospheric composition. 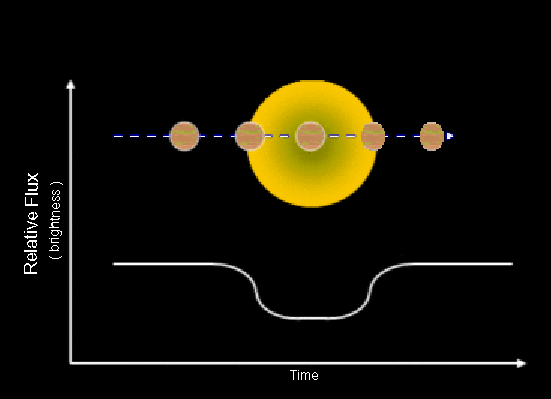 Similarly, when a planet is about to pass behind a star, we are seeing its sunlit side, and we can get reflectance spectra that tell us about the planet’s composition. Also, by carefully monitoring how the brightness changes as the planet orbits, it is possible to tell which parts of the planet are hottest (and therefore brightest) and come up with a temperature map of a planet we can’t even see! There are more than 50 transiting extrasolar planets, and tons more are being discovered all the time. 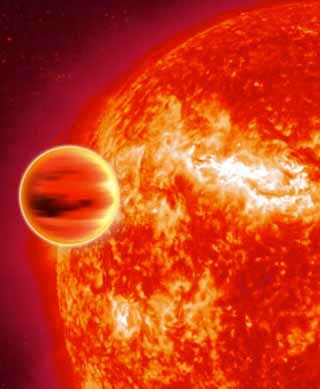 Other exoplanets receive tens of thousands of times more energy from their stars than Jupiter receives from the sun. They orbit in a few days, always face the same side toward the star, and have thousand-degree weather systems with mineral clouds and iron rain! There is the possibility that some planets in systems with less metal may be mostly water, or could have diamond cores. Who needs science fiction when science fact is so strange and awesome? This entry was posted on October 14, 2008 at 2:32 am and is filed under Astrobiology, exoplanets, Not Mars, Volcanoes. You can subscribe via RSS 2.0 feed to this post's comments. Both comments and pings are currently closed.